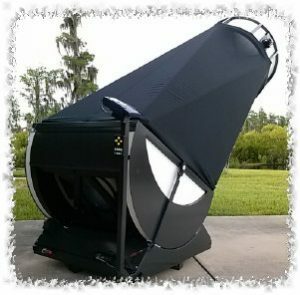 Mike Zammit, owner of StarStructure Telescopes, is relocating his telescope manufacturing facilities to a new dark sky area located 2.5 acres in south-west Inverness Florida next to the Citrus Wildlife management area. At the new facility, Mike will continue to create custom built Truss Dobsonian telescopes that are built to order. He first started building telescopes in 1998 offering all aluminum designs that are easy to transport, easy to set-up and are impervious to weather. Starstructure offers two series of telescopes, the LE series and the Horizon series. These are available as custom-built products with aperture sizes ranging from 12.5” to 40”. The company also offers custom observatory grade telescopes that are tailored to a user’s specific needs.